One of the blog posts I plan to do in the next few days (or weeks) is about my favourite eraser. I have no doubt about which eraser is my absolute favourite, but there are a few other erasers that are very nice to use, too. One of these is the Sanford Design Artgum art eraser/cleaner, model number 73030, an eraser I already mentioned in a previous post that could easily be my favourite if it would smear a little bit less and erase a bit better. Although this last statement did not sound very good, the eraser is not as bad as this sounds. I admit that it will smear first when you start to erase, but if you keep erasing the smeared lead will be removed, as will be any traces of the writings or drawings you tried to erase in the first place. Why do I like it? …because it is very soft and crumbly. From all the erasers I know it is the one with the most comfortable feel to it. 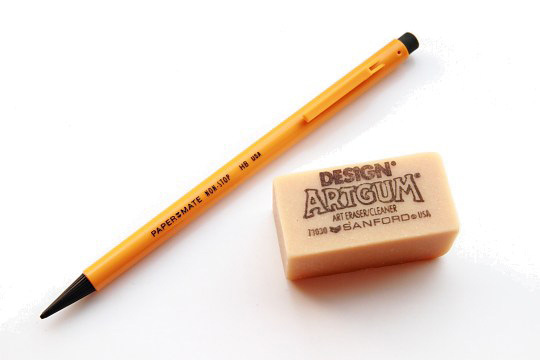 This eraser was originally called the Eberhard Faber Design Artgum eraser/cleaner. Its name changed when Faber-Castell bought EF and it changed again when Sanford took over. The Artgum eraser is available in two sizes and I bought mine, the bigger one, from Granthams, a local shop that is also selling stationery over the Internet. Their current price is £1.22(~$1.92, ~€1.43), which is a good price for Europe. Manufactum sells them for more than three times this price. On the other hand £1.22 is expensive compared to the price you pay in America. I have seen a pack of two fo these erasers from a US web site for 69¢. I mentioned the Paper Mate Non-Stop, seen in the photo, in a previous blog post. A couple of years ago, I tried some comparison tests, and found gum erasers to be the best for erasing ceramic (woodcase pencil) lead marks. The results weren’t as good for polymer (mechanical pencil) lead marks. Still, all the residual crumbles make it unideal at times. These gum erasers are also sold under other labels. They apparently all (or almost all) come from a single manufacturer. Thank you for your comment. Before writing this blog post I was actually checking whether you had a review at Pencil Talk, because I suspected gum erasers might be more common in North America (…they are fairly uncommon in Europe). I could not find anything on your site or was using the wrong keywords when searching. Do normal stationery stores stock these in Canada, or is this item more for specialist art supplies stores? Do you know whether these gum erasers are still produced in the USA? They definitely were in the past. In Canada, art supply stores definitely sell this eraser type. I think it would be less common at the the large office oriented (Grand and Toy, Staples, etc.) stationery chains.